This product with 3-LED for flashlight has high brightness, adding a radio with built-in high quality speaker, is recharged in multiple ways: Solar, USB, Cranking handle. And it even can charge your phone for emergency call while your phone is nearly out of power. Great accessory for outdoors and indoors, such as camping, traveling, climbing, etc. 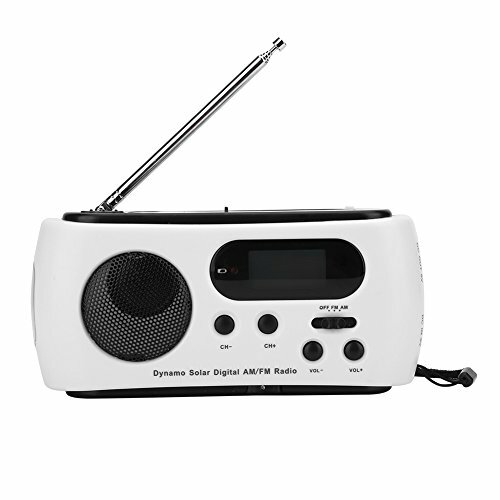 1.HIGH QUALITY SPEAKER: FM/AM radio with built-in high quality speaker for entertainment. 2.ENERGY CONSERVATION&ENVIRONMENTAL PROTECTION: Usually recharged by solar power panel or 360°rotation cranking handle, energy conservation and environmental protection. 3.CHARGED DIFFERENTLY: Also can be charged by connecting micro USB cable to computer or direct charger. 4.3-LED FLASHLIGHT&SUPER BRIGHT: Owning 3-LED flashlight as the light source, super bright. 5.FOR EMERGENCY: Mobile phone can be charged by DC 5V for emergency call as your phone is out of power. This term has no battery compartment, so it doesn't support the battery power. HIGH QUALITY SPEAKER: FM/AM radio with built-in high quality speaker for entertainment. ENERGY CONSERVATION&ENVIRONMENTAL PROTECTION: Usually recharged by solar power panel or 360°rotation cranking handle, energy conservation and environmental protection. CHARGED DIFFERENTLY: Also can be charged by connecting micro USB cable to computer or direct charger. 3-LED FLASHLIGHT&SUPER BRIGHT: Owning 3-LED flashlight as the light source, super bright. FOR EMERGENCY: Mobile phone can be charged by DC 5V for emergency call as your phone is out of power.